The most important thing to remember about Floor Hockey, Ball Hockey or Dek Hockey is that the rules should be adapted for the place that you are playing at. Consider alternatives --- such as no icing, floating blue line, offsides, no offsides, no blue line, two line passes etc. Never be afraid to adapt your rules or change them on an annual basis as needed. 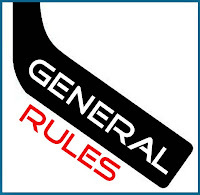 The basic rules provide for a minimum amount of games for players to play in order to be eligible to participate in the playoffs. Sticks, player equipment and goalie equipment are not usually defined as long as it is of the floor hockey variety and not ice hockey. The rules should set out the length of periods, overtime (if applicable), ball type, number of referees and penalties. For safety purposes, high sticking should be clearly defined and enforced. Basic playing rules include definitions for off-sides, penalties, play clock (running or stop time) and scoring. The rules for intramural floor hockey as promulgated by the National Intramural Recreational Sports Association are listed below along with some generalized rules from leagues around North America.